Kaaz LSD's are the ultimate aggressive LSD. Used on our own VAC "Silver Bullet" E36, these LSD are awesome for max performance street cars and race vehicles. Proven over years of track time to work fantastic in BMW applications. From Japan, the home of competitive drifting, these LSDs are developed not just to work, but to hold up to abuse! function is great out of the box: settings can be adjusted to your own preferences. Customizing varys from initial torque settings / locking rate adjustments / plate thickness adjustments etc. and all can be done by the end user, or straight from Kaaz with help from our techs at VAC! When purchased from an authorized retailer like us; the Kaaz LSD line offers great pricing, and most of all GREAT service: in any case they need assistance in installation, maintenance, re-builds, setup etc. you can contact KAAZ USA directly for support. All spare and optional parts are available in the USA. This means no downtime in sending the LSD’s back to Japan for support. If you are Drag Racing, Road Racing, or Drifting your BMW; Kaaz LSD's can put you in the winners circle. 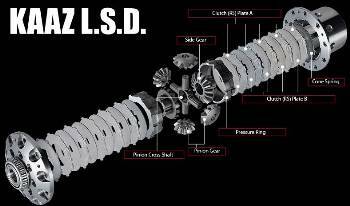 Kaaz LSD will work when the slightest torque is applied inceasing drivetrain feedback. Better transfer of power from the engine to the drivedrain with minimal loss of power. Plate Abrasions are reduced by spreading power to more surface area on the bigger plates. Increased number of friction plates to greatly improve abrasion efficiency and heat capacities. All parts on the LSD have been made larger, so the overall strength of the main body is increased. By default, each KAAZ comes setup as a 1.5way locking diff, ideal for most BMW drivers. Can be setup as 2-way for extreme drifting use for those who wish, or we can order it for you like this on request. For a street car we recommend KAAZ Super Q line; developed for the Porsche and BMW owner, this offers quieter, smoother performance and longer life from the clutch disks in the LSD, plus no need for break in. As an authorized retailer of Kaaz; we can help you chose and get any Kaaz product at a great price, fast! Call or email VAC.